CWDS held a Solution Demonstration on Dec. 4 to provide stakeholders with an overview of the Snapshot tool, scheduled to roll out early next year. For more information about Snapshot and the CWDS Roadmap, visit our project dashboard. On August 14, the CWDS Intake Digital Services Team and Technology Platform Team (TPT) held a monthly Solution Demo to update stakeholders their progress to replace the legacy CWS/CMS system. Watch the video below. On August 3, the CWDS DevOps Engineering team held a status meeting, called a "Sprint Review" to discuss their progress on the project. Watch the video below. Child Welfare Digital Services hosts brown bag lunch series with monthly guest speakers on a range of topics. On July 14, 2017, automation expert and former Googler Mike Bland presented to staff. On July 11, 2017, the Child Welfare Digital Services project hosted a quarterly forum for stakeholders to follow the state's progress to replace the legacy system used by county case workers across California. A portion of this video recording was inaudible and not published. See the complete presentation slide deck here. CWDS conducts monthly Solution Demonstrations to provide all stakeholders with an overview of our latest system developments. On June 19, 2017, the Intake Digital Service Team provided an update on their progress, watch the video online. 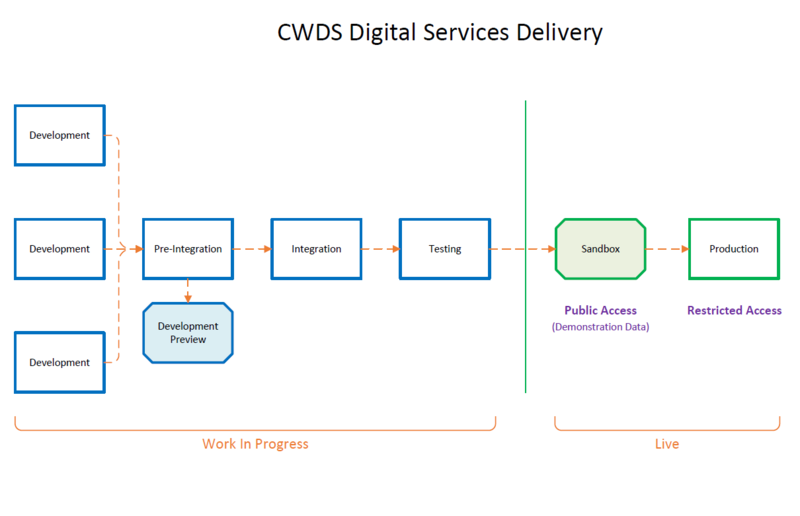 Later this year, CWDS plans to launch a “sandbox” for the public to see features in the new system. While the child welfare system can only be accessed by authorized personnel whose job is to protect children, the sandbox will give the public a view into the new system using demonstration data. Below is a chart that shows the delivery cycle for software features deployed into production. The project’s eight modules will be launched in stages, with ongoing enhancements to be deployed on the modern infrastructure that will offer a vastly improved user experience. The blue boxes on the left side of the graph represent the research, design and development of products in partnership with Core Counties , on behalf of users across the state. The green boxes represent finished code that has been deployed. As the project gets ready to deploy software to the counties, each county will have its own implementation lead to guide and support implementation readiness activities in the areas of project management, communications, data cleansing, organizational change management (OCM), staff training, and technical readiness.